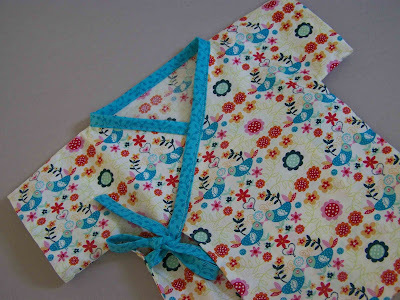 I mentioned yesterday that I had finished Habitual's Baby Kimono Top. She offers a free pattern for personal use. You can contact her if you are interested, but you should definitely stop by her blog-she is mighty inspiring. The sizing for this particular top is supposed to be 0-6 months, but from looking at the finished top I am guessing that it is closer to the six month mark. I love the way that it turned out. 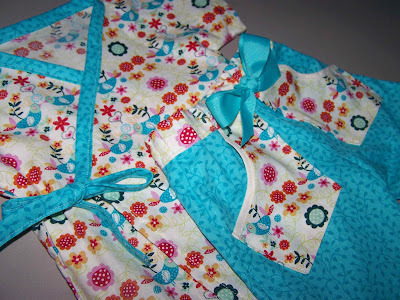 I really like the fabric choices (both from Joann's). After I finished the top I knew that I wanted to find some bottoms to go with it. After scouring the internet for ideas I was left a bit down. I couldn't find any patterns that I thought would work with this particular top. I then visited a friend's house, luckily for me she has a huge collection of patterns. 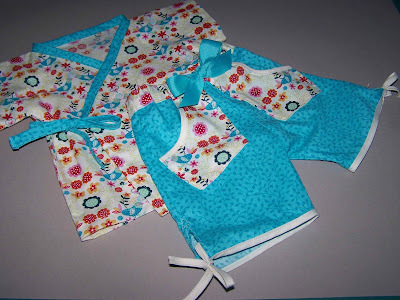 She is very generous and allowed me to try out a couple of patterns. 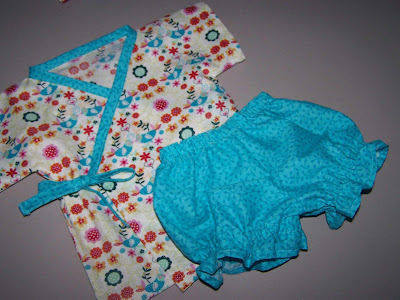 I still didn't find any pants that I liked, but I did find a pattern for some cute ruffle leg bloomers. I ended up making size 6 month bloomers, and hopefully the top and bottoms fit at the same time. One of my frustrations with patterns is that they often tell you to measure the waist of the child to determine the size of the elastic waist. I don't have a child to measure...so I had to head to the basement and dig through bins of stored baby clothes to find some pants that looked like they'd fit at the same time. 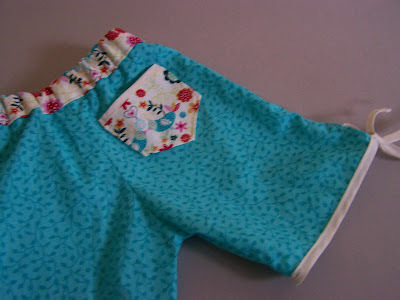 I found 9 month pants and made the waistband slightly smaller. Since I'd already dug through the bins for clothes and I still didn't have a pair of bottoms that I was crazy about, I decided that I should try my hand at making my own pattern. I was super overwhelmed with the idea, but it didn't end up being as difficult as I'd imagined. I laid out the pair of preexisting pants (folded down the middle) on some paper, traced the shape and length of the leg, added in a 5/8" seam allowance on the necessary sides, and cropped the pants to the desired length. By the way I wanted these to be capri type pants. I wanted to tie in both of the fabrics of the top. I made the waistband from the floral/bird fabric, along with some front and back pockets. 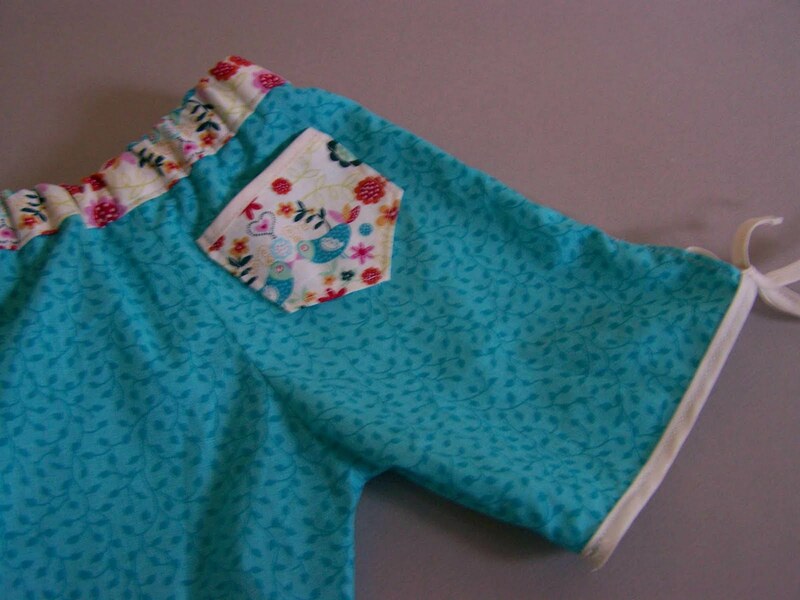 I angled the pockets to repeat the angles on the top, and added a split side to the pants with bias tape to finish the hem and add some ties to the legs (also a bit of repetition from the top. I think that they turned out pretty cute, what do you think? Now I just have to worry about the pants fitting an actual baby. Maybe if these work out I'll make a pattern for you to enjoy as well. One more project checked off the list. I'm your newest follower from New Friend Friday! Hope you'll visit me back! !